This thread is for posting Orders of Battle for the Pre-Industrial Fantasy STGOD. Please familiarize yourself with the OOC thread before posting. No Godmode, obviously. This includes decisions regarding your faction’s capabilities and backstory that might interfere with other participants. Comply with all forum rules, obviously. In the event of a dispute or question, the game moderator/host's decision is final (unless its a matter of forum policy of course, in which case take it to an actual moderator). Please try to post fairly regularly. If you will be absent for an extended period of time, notify the other participants in advance if possible. To join, post an Order of Battle in the OOB thread outlining your faction's economic and military capabilities, in accordance with these rules. Additional information is optional, but encouraged. No technology invented post-1800, as a rule. Exceptions will be considered on a case-by-case basis. Maximum starting population is fifteen million. Each faction starts with a maximum of 300,000 points (you may play a smaller faction if you prefer, of course). As a baseline, one point equals one typical human soldier. You will gain 10 percent of your starting points per year of game time, up to a total of 350,000 points in peacetime and 500,000 points in wartime. Game time will be counted in seasons, with the game moving on to the next season after approximately one month in real time, or at the host/game moderator’s discretion, provided no one raises a major objection. Once the game moves on, no changes can be made to established events of previous “seasons”. Recruitment of new units and construction of new buildings/vessels/artifacts, etc. will take about one season in game time, as a baseline. The more points you spend on a given structure/vehicle/magical item/military unit, the greater its military strength. Powerful magical effects or cutting edge technology (by the standards of the setting) should be especially pricy. “Reasonable levels” of existing fortifications at the start of the game will be counted as part of the terrain, and be free of cost. Construction of major new fortifications will cost points, with 500 points for a small stone keep as a baseline. An attacking force should generally suffer a reasonable number of casualties in attacking a fortification, and a substantial delay in trying to besiege it. You can also trade points to another faction, represented in-story as trading valuable goods. This is a way to eventually exceed the point limit via trade and negotiation. I.e., you can say “I’ll give you such and such, in exchange for x number of points worth of trade.” This will then be subtracted from the other nation’s points total and added to yours’. Trade with NPC factions off the map is permitted, but should be limited in scope. You cannot use this to exceed the point limits. Calling in allies/vassals from off the map is entirely prohibited. The outcome of engagements will be determined by agreement between the combatants, or by the point value of the forces deployed. In the event of a tie or dispute, the decision will fall to the game moderator/host, though this should be unlikely. If you wish to involve deities or comparably powerful beings, this can be done through two means. You may have a being intervene in support of a faction or against another faction, and subtract an appropriate number of points from your total for that intervention (major interventions should be worth at least tens of thousands of points each). Alternatively, you may ask the game moderator/host to do a 1d6 dice roll to determine the result. 1 equals a large-scale intervention in your favor. 2 equals a large-scale intervention in your favor in exchange for great sacrifices or other costs (to be deducted from your points). 3 or 4 equals no intervention or more than one beings cancelling each other out (no effect). 5 equals a large-scale intervention against you (backfire). 6 equals great losses to your nation (on the order of the majority of your territory or point value). The exact effects of a given result will be determined by mutual consent among the directly effected parties, or in the event of a dispute, by the host/game moderator. We will be using a map of North America for the game (credit to Jub for map editing). Feel free to play around with local geography and climate somewhat, but no altering, removing, or adding major features such as major lakes, major rivers, and mountain ranges. Players may decide on the nature of the NPCs near their territory, in consultation with their other neighbours. Just avoid anything too out their/overpowered, as usual. The game will start at around the Winter Solstice. One final note: While I will be the primary host/game moderator for this game, Simon_Jester will fill in for me if I am temporarily unavailable. Re: Pre-Industrial Fantasy STGOD Orders of Battle. Excerpts from a traveler's guide to the western nations. The Syilx (IPA: sjilx) people claim the lands of the interior of British Columbia from Lower post, just south of the Yukon border, following the Rocky Mountain Range down to Red Mountain. Here the border turns westward following rivers to the Pacific with the southern border anchored at the mouth of the Columbia River. The border then turns north again giving Syilx a narrow slice of land bordering the Pacific Ocean. Then it turns east at the mouth of the Chehalis River continuing eastward to Mount Rainier. Here the border runs north through Mount Baker-Snoqualmie National Forrest, following a series of valleys and rivers, until it hits Hope. From here the border follows the Fraser north to Junction Sheep Range Provincial park, to the southwest of Williams Lake. From here it continues north along another series of rivers until finishing the loop a Lower Post. Altogether the Syilx lands cover an area of 616,000 sq km. The Sylix lands are further divided into 18 regions. These regions are chiefly classified as being agricultural, mercantile, cultural, or mixed depending on their economy, religious significance, and general perception among the leaders of the Syilx. The lone exception to this rule is the Okanagan region which is classified as the capital region owing to its inclusion of Kelowna, the capital of the Syilx nation. As a people the Syilx are, somewhat paradoxically, close-knit while still allowing each of the thousands of tribes a fair deal of autonomy. Rulings from Kelowna are seldom outright ignored by even the most powerful tribe, but the implementation and interpretation of any given ruling can vary wildly from tribe to tribe. This causes occasional friction between tribes, and some feuds can last for decades with each clan raiding the other until one side submits, or an outside force steps in to resolve the issue. Thankfully most feuds are settled via negotiation, sport-like duels between champions or small groups of warriors, or by one tribe uprooting and moving away from the source of irritation. This leads to a state of affairs where some conflict is inevitable, but full-fledged civil uprisings are blissfully rare. The current leader of the Sylix is Mur Claʕtiw̓s T'ik̓ʷt (Smooth Valley Lake). He has ruled the Syilx for seven years having been elected to the position by the leaders of the 17 non-capital regions. The election was held after former leader ʕaymt Qəmqamt (Angry Calm) stepped down due to worsening health. The leaders of each region are elected by a vote of the elders of the seven most powerful tribes in that region. Syilx society is divided into castes. The members of the top caste are the great priests, non-religious men showing great leadership skills, and the first wives of these men; the next caste would consist of the lesser priests and highly skilled craftsmen; below them would be average craftsmen, priests in training, hunters, and warriors; below them are farmers and gatherers, and the lowest caste consists of slaves either captured in raids or those born into the caste without enough skill/guile/charisma to earn freedom. Somewhere between warriors and skilled craftsmen lie the intelligent animals, but I'll have more on them later. The Syilx military is one comprised primarily of four distinct classes of warrior; though many of the categories might be better described as gods or monsters. These classes are guardian spirits (gods), totem beasts (monsters), intelligent animals, and human warriors. Each type generally serves a different role and compliments the other types. The first class and one I've never seen in action are the guardian spirits. These are the big guns, the ships of the line, monsters the length of a lake or the size of a mountain. If what I've heard holds true these are never called except as a last resort, partially due to the sacrifice of goods, food, men required to wake them, but also due to how hard they can be to put back to sleep. The lore keepers tell of a time, some 200 years ago, when the Ogopogo was called upon. He took the form of a great serpent at least 80 kilometers long and hundreds of meters thick. The thing barely needed to attack. The enemy was routed near instantly, their weapons, including at least one siege mortar, just seemed to bounce off and make him mad. Adding insult to grievous injury, Ogopogo also beset the enemy with storms muddying the trails and allowing them to be run down and captured. Sounds like a great ally, right? The downside was that a massive, hungry, and deeply egotistical living god is now living in your main fishery and trade route. The better part of next three years were all about him, keeping him happy, feeding him enough crops for thousands of men. Thankfully gods bore easily, and sometime in that third year, Ogopogo sank back into the lake and went to sleep. Even then, the people of the Okanagan prayed twice as hard and sacrificed three times as much for at least a generation. The next class is the totem beasts or spirits, depending on who you ask. These are the heaviest hitters that the Syilx will actually plan on using. They come in all shapes and sizes, but the common sizes seem to be longhouse sized for the largest cities, cabin sized for lesser settlements, cart sized for bringing to war, between smaller than cart sized but too small to carry, and small enough to be carried by a man. The size isn't the only thing to keep in mind, these totems aren't just carved in the shape of a massive bear, or the world largest stag, they're carved into animals that can't and shouldn't exist. The one that stays with me is a massive bear the size of a large cabin. Only, you wouldn't call it a bear if you saw it up close. This bear has hundreds of eyes on its head, some big and bright like an eagle's, others all clustered up like an insect's. It also had massive ears, sort of like a wolves, only oversized. And when it opened it's mouth it had three rows of teeth, the middle ones constantly moving like a saw. On it's back it had a mass of tentacles all ending in wicked curved claws the length of a man's forearm. I don't want to dwell on what it looked like in a fight, but it beat the better part of two companies of men back by field guns before walking back home. Not that I want to dwell, but these totems tend to require some downtime after use. If the totem spirit manages to return on its own, the period is far shorter than if they're felled. The time between summonings is based on the size of the totem, something man-sized might take an hour while something the size of a cabin could take a week. I think things can be speed up with rituals, but I haven't seen it personally. The third class, and finally we're returning to sanity, are the intelligent animals. Like the name suggests these are animals that are about as smart as most men. I think they were originally spirit animals or maybe spirits bound to animals. Either way, the Syilx have a collection of bears, wolves, cougars, elk, eagles, hawks, owls, ravens, badgers, weasels, raccoons, beavers, and even squirrels working with them. When I say working with I don't mean as mounts, I've seen bears done up in warpaint and wearing plates of bronze armor talking battle strategy with a raiding party. Of course, these animals also get used as scouts, after all, who's going to be able to tell a smart squirrel from a dumb one? These animals get treated well, at least as well as a renowned warrior or a mid-level priest. They have their own homes, engage in trade, and rare as it tends to be, they can even be elected as leaders of tribes and communities. You'd do well not to treat them as anything less than a man and it'd be smart to treat them as much more than that. The fourth and final class is the Syilx warrior. They're fast, strong, and the next best thing to fearless. They're the equal to most warriors out there and they don't use anything beyond bronze-tipped spears, horn bows, slings, and leather shields. Of course, none of these things are exactly what they seem once the spirits of the forge, mill, and tannery gets to them. The spears go through plate armor about as well as a good pick, the same can be said for the arrows, the slings cast stones that don't hit very much lighter than a pistol, and the shields can withstand musket fire. Added to this is the fact that when their war paint’s on they're just plain better physically and mentally than other men and you get a fighting force to be feared. Still, they do have weaknesses. For all their speed and endurance, they can match the average horse for speed while running distances that would kill or lame a horse, they don't have the mass of a horse and can't charge enemy lines nearly as effectively. They're also unarmored and if you can get past the shield they drop like any other man. They also don't tend to fight in formations, at least not the neat squares, and ordered lines come to mind when you say formation. So if you're ever looking to defeat them, hold your lines, and hope they don't send anything tougher than warriors your way. This next bit was written by an acquaintance of mine. I can't confirm all of it, but it fits with what I know of the Syilx and their way of fighting. Most units are ad-hoc arrangements of men, intelligent animals, and totems from a group of allied tribes. These units can contain anywhere from 12-5,000 warriors and animals. Smaller groups of soldiers are often combined or mixed into larger units as required. Due to the nature of the Syilx social order, each soldier is brave, disciplined, and skilled, but the Syilx army lacks the unified command structure and thus the coordination that one would see in other militaries. This has led the Syilx people towards extensive use of skirmishing tactics as a way to avoid fighting the enemy in a pitched battle where the Syilx weaknesses can be exploited. If allowed to skirmish the Syilx generally prefer to break down into units of no more than 30 warriors/animals. In these raiding parties, they will attempt to infiltrate up to the enemy lines before capturing couriers, killing sentries, cutting horse lines free, starting fires, and generally causing mayhem. Unlike normal raids these attacks do not carry back captives unless said captives were the raids main objective. Many intelligent animals are of vastly more use when conducting raids than they are in pitched battle. When forced into a more formal line of battle the Syilx tend to form multiple thin lines rather than formations with true depth. A syilx army of 10,000 defending on the plains will likely form six open lines, men standing just under arms length apart, of three warriors deep. Two lines will be melee lines with spears and shields at the ready and slings and stones carried. The next two lines will be slingers with slings and shields and spears planted in the ground next to them. The final lines will be archers, with shields and spears set as a pavise formed up spear and shield. At the flanks will be those intelligent animals useful in a straight forward fight. Some of these animals will be dressed in armor of gleaming bronze, brightly colored leather, and fantastic warpaint while others remain unburdened and naturally colored. Behind the lines will be the totems, the dozen or so highest ranking tribal leaders, the intelligent animals not useful in a fight, and the supply train. In such a battle the Syilx prefer to hang back as the defender, sending totems crashing at enemy lines but generally not advancing until the totems have broken a section of the enemy line. These lines often fair poorly against a determined cavalry charge, disciplined units of men that don't allow the Syilx to turn a battle into a series of duals, and massed gun lines that fail to break under assaults by totems. The one saving grace is that routing warriors and intelligent animals are often difficult to chase down and many a battle turns into a series of standoffs, skirmishes, and fighting retreats designed to draw the enemy thin and allow the Syilx to use their strengths. However, this strategy must be well excuted or it risks the capture and/or destruction of totems and supplies greatly hurting the Syilx war efforts. They raid, they get shot at, and usually run off with a handful of captives. A tribe taking captives for sport, or as a right of passage, will leave a sign behind letting their victims know who they need to trade with to get their people back. This type of raiding usually sees captives traded back without too much stubbornness over the exact price being met. Of course, if they're obviously being lowballed they play the game right back. In the case where nobody comes forward to trade for them or a group of simply tries to take the captives back by force, the captives become slaves. Slaves don't have much by way of status and often do the manual labor that other people don't want to do, but they're given decent housing, fed well, if not with the finest foods, and aren't expected to work hours that any other laborer would balk at. During their off hours, they're allowed to socialize so long as they've not tried to escape. It's also customary to give them an allowance to spend, and given that their food and housing needs are covered by their owners some slaves have more free income than lower class non-slaves. Slaves are free to, and in fact, encouraged, to marry and start families. Slaves with exceptional skill, guile, or charisma, as well as those that end up with very large, and thus powerful, families tend to be released. Their wives, children, grandchildren, and so on down the line are released with them. Usually, the release of anybody with a reasonably sized family results in a festive feast. Due to this system of releasing slaves, some now prominent tribes started off as families of slaves. The downside to this is that some tribes split up families, deny the familial connections between slaves, and generally do shady things to keep from having to release significant numbers of slaves. Groups taking captives to sell as slaves tend raid far less often, but are far more ruthless when they do raid. These are the kinds of raids that leave villages burned with as few witnesses left behind as possible. They also tend to raid other Syilx tribes if they think they can get away with it. Those in change or the Syilx can't come out against these types of raids officially, but groups that engage in this kind of raiding don't tend to get invited to important gatherings. Their captives are sold as slaves, first in Syilx lands, then back to the lands they were taken from, and if nobody else wants them to Tarn. The Syilx look down upon having to buy slaves from slave traders preferring to gain them through raids, in the course of normal trade with other tribes, or having them included in the bride price at a wedding. Still, a weaker and less prestigious tribe or a prestigious tribe that has fallen upon hard times will buy slaves in this fashion as a way to help them leapfrog other groups in terms of economic output. As a result, purchased slaves tend to be worse off than other classes of slaves. The Syilx economy is one which could be self-sufficient but which enjoys enough of a surplus to engage in trade. The main trade goods are, in no particular order, slaves, ores, gems, art objects, furs, skins, fish, preserved meats, and grain. Some items are shipped overland, most notably slaves to Tarn, but most are shipped to forts along the border and then sold from there. Slaves have been touched upon in earlier pages, but most slaves are freed within a year or their capture. Of slaves that aren't freed most stay within Syilx lands. The slaves which are sold externally go almost exclusively to Tarn in three large shipments per year in great overland marches. The ores sold by the Syilx are often noted as being especially pure, and if not pure they contain useful blends of additive materials. This wouldn't be noteworthy if not for the fact that these ores are shipped in nuggets instead of the more traditional ingots which most nations use for trade. This is due to the fashion in which Syilx obtains ore. Instead of attacking the land with pick, shovel, and dynamite, they pray to the spirits of the earth and mountains and in return these spirits disgorge a steady stream of ore. This unusual method is labor saving and far less risky than traditional mining and produces very good ore, but it also cannot be scaled up beyond what they spirits are willing to give. The mining of gems is much the same as the mining of ores, and much like the ore, most gems are shipped in a very large and uncut state. Art objects are another chief export. These objects are mainly carvings of wood and stone and tend to depict animals, warriors, elders, and, of course, the spirits and gods of the Syilx. These carvings can run the gamut between plain, simply adorned, and gayly (some would say garishly) painted. Other art objects are woven tapestries and blankets, jewelry, dream catchers, and pottery. The last group of trade goods consist of furs, skins, fish, meats and grains are fairly standard. There isn't much to say on this topic. These goods are often traded away in times of plenty and traded for in times of need. The Empire is one of the largest and most powerful nations on the continent and has existed for nearly three thousand years. Technically the Fifth Orion Empire, it has existed under the reign of the House of Wallace for nearly nine hundred years. The Empire maintains one of the largest and best-trained militarys in the world, aided by it's heavy use of Technomantic-enhanced artillery and Telepaths and Psychomancers to create a strong bond between soldiers and allow easy communication. Regiment Artillery – 200 men, 25 Orion Technomantic Guns, (10 points per gun, 1 point per man) 450 points (Note: two Batteries operate “field” guns of 36 pdr size while three batteries operate “light” guns of 18 pdr size). A Regiment comprises 5,040 men and costs 10,125 points in total. Frigates (70): Indefatigable, Indomitable, Excellent, Constellation, etc. Telepathy: Allows users to communicate mentally with other humans and telepaths. Within line-of-sight, thoughts and ideas can be "transmitted" to any human, beyond that distance only other telepaths can be contacted. They are deployed with Army units and Navy ships to allow easy communication between units and commanders. They are also used for communication between towns and cities of the Empire. Psychomancy: Subset of Telepathy, users can influence both friend and foe alike. Used on friendly troops it boosts espirit de corps and the will to fight, it makes soldiers dismissive of friendly casualties and stops them from deviating from firing drills in the midst of battle. When used on enemies it makes Orion troops appear like monsters out of nightmare. Interromancy: Subset of Telepathy, users can tell the truth from a lie when talking to 99% of humans and can extract information from people's minds, even from the subconscious. Users find common employment with the police and the Diplomatic and Intelligence Services. Mnemomancy: Grants users a perfect memory (some examples can remember exact, verifiable details from an extremely early age and have never forgotten a thing) and a natural understanding of any languages. These Mages find common use in the Diplomatic and Intelligence Services, as well as within the Imperial Academy. Biomancy: Users can manipulate people's bodies for healing purposes. They can eliminate infections and diseases, dull pain and diagnose problems without exploratory surgery. Technomancy: These enchantments lower an object's weight without altering it's mass. It is most commonly used in heavy guns for ships and land-based artillery. For example, an Orion 36 pounder long gun weighs and behaves like a 12 pounder gun would. The enchantment is also applied to the shot, while a special additive is included in the gunpowder that cancels the enchantment on the shot but not the gun, allowing the shot to regain it's normal mass without losing any of it's velocity. The Ottoman Empire in the Americas dates from 1453, when the desperate Eastern Roman Empire, with nowhere to turn in the face of overwhelming Turkish might, sacrificed fully half the collected Imperial treasure-store to the ancestral pantheon - specifically Poseidon, the God Who Shakes the Islands - for deliverance. Just moments after they embarked from their Anatolian camps, Sultan Mehmet's troops found themselves in the midst of the fiercest storm any of them, indeed any human since Atlantis had seen. The storm blew for weeks, hurricane-force winds shattering the masts of the ships and the oars of the galleys, hundred-foot waves tossing men and beasts into the raging sea, drowning thousands, and when it finally subsided the Sultan's army was further from their ancient homeland than any of them had ever been. Mehmet and his chief captains landed at the mouth of a great river, the equal of the Nile, and considered their situation. They knew not where they were, or what had happened, but it was clear to all that there could be no return. Whatever force had cast them here could do so again, easily, even if they knew how to return to the Mediterranean. The army quickly set about building a camp from the wreckage of their ships, then a city from the pines they found growing nearby. The local tribes, faced with either peaceful assimilation or a starving army of 100,000 battle-hardened men on their borders, quickly submitted to Turkish rule, and the tolerant Ottoman tradition made for a rapid merging of the two societies. Over the next centuries, the fiery Islam of Mehmet and his men faded, replaced with a more animistic worship of the Great River as a kind of All-Merciful Providing Spirit. The River brought the exiled Ottomans their food, their brides, and their trade; while they began by thanking Allah for the River, the exiled Turks soon found themselves thanking the River directly. Without any clear idea of where Mecca lay, they oriented their mosques north, towards the headwaters of the River, and their soldiers cried "there is no God but God, and his River is the River." Mehmet and his successors pushed the Empire's borders northwards along the Great River, fighting when needed but largely preferring to assimilate local populations in order to add to the Imperial population. By most counts the Sultan's domains now include nearly ten million people, most at least nominally adherents to the new River-Islam. The Empire of today is a unique mix of Mehmet's centralizing Islam and the more democratic animism of the natives. By the time the Empire re-established contact with Europe in 1577, it was too established in its new home to return, and the power vacuum left by Mehmet's disappearance had been filled for a century. Extensive trade across the Atlantic and throughout the Caribbean keeps the Ottoman coffers full, but there is no possibility of a transatlantic Ottoman superstate. The Empire is bookended by the great cities of Yenistanbul, the New City, where Mehmet's troops first landed (OTL New Orleans, more-or-less) and Mehmetan, the City of Mehmet, near the northern extent of Ottoman territory (OTL St. Louis). Mehmetan, while only five decades old, benefited greatly from the conquest of Cahokia, a huge native mound-city across the River; its population was resettled to the strategic confluence of the Great River and the Missouri (the latter called by its native name, the former by its Ottoman) after its priest-kings refused to convert. Only limited settlement has taken place East of the River, as most Ottomans prefer to have one border secured by the physical embodiment of their God. Ottoman science has progressed in fits and starts since the Exile, and remains at a very uneven level today. Militarily, Imperial artillery is some of the best available, with high-quality craftsmanship mated to efficient standardization. Other weaponry is mediocre at best; muskets are optimized for rapid fire rather than accuracy or reliability, as Ottoman troops prefer to use the shock of a few vollies to cover their advance into grenade and melee range instead of exchange fire, and troops wear armor not substantially different (mail and segmented plate) from what Mehmet the Exile's forces wore. In part, this is due to the comparative ease of Imperial expansion up the Great River. Massed cavalry was usually good enough to secure victory against native forces, and when it was not the sheer ferocity of Ottoman infantry could be relied upon to do so. The current Sultan is aware that other powers have surpassed his subjects' science, and is seeking ways to address the problem. Industrially, the Empire is very proficient in its traditional areas of expertise. Ottoman textiles and ceramics are unmatched, supporting the extensive trade networks that enrich the Sultan's treasury. A mix of native and traditional foods are grown and harvested, with rice, wheat, corn, and sweet potatoes being the prime food crops, with chickens and goats the prime livestock - cows are kept largely for milk, instead of meat. The Empire is also blessed with substantial mineral wealth, with huge reserves of lead, iron, and diamonds. An unusual ore called 'bauxite' has been recently discovered, but no clear use for it has been found as yet. Magically, Ottoman priests have managed to meld River-Islamic theology and traditionally craftsmanship admirably. Etched Koranic verses lend strength and flexibility to armor, sharpness to blades, and accuracy to cannon and (very high-end) hand weapons. The same techniques are used to produce the equally beautiful and useful tiles that coat the outer faces of Ottoman fortresses and warships. Similar effects can be achieved in fabric media, and the successful development of cavalry lizards from native alligators is detailed below. That said, commonplace Ottoman magic is largely passive in nature, with only a few ghazi Orders preferring to use the supernatural offensively as a matter of course. Some philosophers have speculated, however, that this might change if the Empire ever found itself in serious conflict with a more obviously-magical state - the remains of Islamic reticence concerning the supernatural grow weaker every year. The Imperial army is structured along the lines of Mehmet's forces, with a strong core of regular Janissary troops directly serving the Sultan (though without their traditional recruitment areas the Corps has become an elite volunteer organization drawing from the whole Empire), and a mass of feudal troops of varying quality supporting them. The Ottomans learned from the native shamans, though, and new orders of ghazis (holy warriors empowered by the River God and various subservient spirits) fight alongside the army. They may be thought of as analogous to the Old World's religious knightly orders; technically subservient to the Sultan in his role as Caliph, but prone to independent action when least convenient. The Empire has been resistant towards using magical beasts in battle, with one comparatively recent and very noteworthy exception, but does not mind dealing with nonhuman civilizations in order to obtain a strategic advantage. Janissary Corps, 29,000 men and 300 guns totalling 111,000 points. The Janissary Corps is the cream of the Ottoman Army, recruiting from the very best of the less-prestigious units. Its troops are fanatically loyal to the Sultan, and their native talents, incredible esprit-de-corps, and prodigious magical enhancements has allowed units of the Corps to defeat enemies at tremendous odds. A unit of Janissaries simply will not retreat except in the most extreme of circumstances, and Ottoman military history is full of examples of Janissaries either carrying the day through a mixture of persistent ferocity and cunning tactics or dying to a man rather than admit defeat. Corps infantry are disdainful of long exchanges of fire, preferring use the shock of close-range volleys to carry them into grenade and melee range. Janissary cavalry is largely composed of lancer units, although their etched armor, pistols, and long swords make them capable in the melee as well. Recently, part of the Corps cavalry has been converted to dragoons riding magically-altered and enhanced alligators from the southern hinterland, tremendous beasts with scales etched with protective spells. These creatures, besides being fantastically durable, have the ability to run for nearly a day without resting and bite clean through an armored man. 4x Janissary Infantry Brigade, elite line/shock infantry, each 5,000 strong. 3 points per man, 15,000 points per brigade, 60,000 total. Each brigade is formed of five 1,000-man regiments, themselves consisting of ten 100-man companies. One company per regiment is additionally trained in skirmish tactics and marksmanship, but remains able to stand in the line of battle. 2x Janissary Cavalry Brigade, elite lancer cavalry, each 2,000 strong. 3 points per man and 1 point per horse, 8,000 points per brigade, 16,000 total. Each brigade is formed of four 500-man regiments, themselves consisting of five 100-man squadrons. 1x Janissary Lizard Dragoon Brigade, elite monster-riding dragoons, each 5,000 strong. 3 points per man and 3 points per lizard, 30,000 points per brigade. Each brigade is formed of five 1,000-man regiments, themselves consisting of ten 100-man companies. 25x Field Artillery Battery, 10 6- or 8-pounder iron smoothbore cannon with etchings promoting rapid fire and accuracy. 15 points per gun, 150 points per battery, 3,750 total. Attached at the regimental level to infantry and dragoon units (as horse artillery in the latter case) and trained in brigade- and division-level coordination. 5x Heavy Artillery Battery, 10 18- or 24-pounder iron smoothbore cannon or howitzers with etchings promoting ease of handling and accuracy. 25 points per gun, 250 points per battery, 1,250 total. Attached at the brigade level to infantry and dragoon units. Timariot Corps, 55,000 men and 360 guns totalling 101,000 points. Partially evolved from the feudal levies of ages past (timariot cavalry is still almost entirely supported by great nobles, while the infantry is raised locally but paid from the Sultan’s treasury), the timariots are the shaft behind the Janissary spearhead. Ferocious in battle and tenacious on campaign, the timariots - thanks to their local origins - also offer a much more diverse skillset than the centrally-organized Janissaries. Individual magical enhancements are rare outside of the noble-raised sipahi regiments, who are nearly as deadly as their Janissary counterparts, but both the akinci and yaya units benefit from morale-boosting effects woven and etched into their unit standards. Timariot troops are unevenly trained in large-unit coordination and tactics, with only select regiments able to work effectively as part of larger formations. The majority of units remain garrisoned in their home regions, but serve as full-time members of the military instead of part-time reservists. Excepting the haughty sipahis, timariot troops can often be found assisting local communities with construction projects or particularly-challenging harvest seasons in between training. Recent reforms have seen a large number of remaining old-style pike-and-shot units converted to line infantry, at considerable cost, and the timariot corps is well under strength at present. Sipahi units are heavy lancer cavalry often recruited from the younger sons of provincial nobility. The spoils of victory offer a rapid path to wealth and power compared to the convoluted traditions of Ottoman inheritance law, and there is never a shortage of recruits. They are armed identically to the Janissary cavalry, with lance, sword, pistols, and etched armor - though of a generally lesser quality. Akinci regiments, on the other hand, are vicious light cavalry - raiders, in all but name - recruited from the tribes and outlaw hosts of the Great Plains. Disdaining magical enhancement, these fierce horsemen nonetheless manage to routinely rout more traditional forces through sheer bloodthirstiness. The yaya regiments - volunteer, in Common - are fairly standard line infantry benefiting from minor magical support in the form of etched weapons and standards. Their tenacity is a remarkable counterpart to the ferocity of their Janissary counterparts, and a unit of yaya infantry can stand a remarkable amount of punishment without breaking. The azabs - draftees - do not benefit from magical support, and are precisely equivalent to the standard line infantry of other states. The number of azabs fluctuates from year to year, as the number of man drafted is only sufficient to cover manpower shortfalls in the volunteer pool. 10x Sipahi Cavalry Regiment, lancer cavalry, each 500 strong. 2.5 points per man and 0.5 point per horse, 1,500 points per regiment, 15,000 total. Each regiment is formed of five 100-man squadrons. 15x Akinci Cavalry Regiment, light (raider) cavalry, each 1,000 strong. 1.5 points per man and 0.5 points per horse. 2,000 points per regiment, 30,000 total. Each regiment is formed of five 200-man warbands. 20x Yaya Infantry Regiment, line infantry, each 1,000 strong. 1.5 points per man, 1,500 points per regiment, 35,000 total. Each regiment is formed of ten 100-man companies.One company per regiment is additionally trained in skirmish tactics and marksmanship, but remains able to stand in the line of battle. 15x Azab Inf Regiment, line infantry, each 1,000 strong. 1 point per man, 1,000 points per regiment, 15,000 total. Each regiment is formed of ten 100-man companies.One company per regiment is additionally trained in skirmish tactics and marksmanship, but remains able to stand in the line of battle. 30x Field Artillery Battery, 10 6- or 8-pounder iron smoothbore cannon with etchings promoting rapid fire and accuracy. 15 points per gun, 150 points per battery, 3,750 total. Attached at the regimental level to infantry and dragoon units (as horse artillery in the latter case) and trained in brigade- and division-level coordination. 6x Heavy Artillery Battery, 10 18- or 24-pounder iron smoothbore cannon or howitzers with etchings promoting ease of handling and accuracy. 25 points per gun, 250 points per battery, 1,500 total. Attached at the brigade level to infantry units. Corps of Artillery and the Mevlevi Order, 10,000 men and 120 guns totalling 42,000 points. Besides the Janissaries and timariots, there are two other major sections of the Ottoman army. The first is the Corps of Artillery, which manages all cannon with shot heavier than two pounds. Its guns are attached semi-permanently to infantry and dragoon units, and individual batteries sometimes have histories with individual regiments stretching back centuries. Ottoman artillery is uniformly excellent, with extensive magical etchings that reduce weight and improve rate of fire and accuracy. The standard gun crew, including all supporting positions, is ten men, and the Corps also has control of the cannon foundries in Yenistanbul. Perhaps for this reason, it is heavily scrutinised by the Sultan’s bodyguard troops, and disloyalty is even more strictly punished than in other branches of the military. A central artillery reserve is maintained in Yenistanbul, allowing for rapid reinforcement of critical fronts. The Mevlevi Order of ghazis is an entirely different sort of organisation. Directly empowered by Allah to defend the Ottoman state and expand the River-Islamic faith, these holy warriors are the most terrifying of the Sultan’s servants. Uniquely, they are subordinate to the Sultan in his role as Caliph, and not as secular subjects; this has caused difficulties in the past and no doubt will in the future. Members of the Order - usually referred to as dervishes - are often found wandering Ottoman territory, supporting peace and harmony in the Sultan’s domains. Dervishes can have a wide range of powers, but common abilities include control of water, fire, air, or lightning, telekinesis, and limited precognition. 10x Field Artillery Battery, 10 6- or 8-pounder iron smoothbore cannon with etchings promoting rapid fire and accuracy. 15 points per gun, 150 points per battery, 1,500 total. 2x Heavy Artillery Battery, 10 18- or 24-pounder iron smoothbore cannon or howitzers with etchings promoting ease of handling and accuracy. 25 points per gun, 250 points per battery, 500 total. 10,000 Mevlevi Dervishes, ghazis (holy warriors). 4 points per man, 40,000 total. The above is an average value; individual power levels are distributed across a wide range. A novice Dervish might be worth as little as 0.5 points, while a very strong Master Dervish might be worth as much as ten. The Ottoman Navy, while decidedly junior to the Sultan’s armies, is still a force to be reckoned with in the Caribbean and on the Great River. Ottoman ships benefit greatly from Turkish magical talent, with larger ships (heavy xebecs and larger) frequently boasting etched armor plating and weapons. The two main fleet bases are Yenistanbul and Mehmetan, with the former hosting the ocean-going ships of the Navy and the latter serving as home to the river patrol squadrons. Yenistanbul Fleet, 140 ships totaling 33,800 points. 10x Ship-of-the-Line, 74-gun two-decked sailing warship. 800 points per ship, 8,000 total. 30x Frigate, 36-gun single-decked sailing warship. 400 points per ship, 12,000 total. 30x Heavy Xebec, 26-gun hybrid sail/oar galley. 200 points per ship, 6,000 total. 60x Xebec, 20-gun hybrid sail/oar galley. 130 points per ship, 7,800 total. Mehmetan Fleet, 50 ships and 200 gunboats totaling 12,200 points. 40x Xebec, 20-gun hybrid sail/oar galley. 130 points per ship, 5,200 total. 200x River Gunboat, 4-gun light galley, 25 points per ship, 5,000 total. Putting it there avoids the whole messy business of the edit window, and gives me slightly better formatting ability. Physiologically the hyenorks aren't human. An adult female stands a comfortable 3m tall or 2m at rest with a Summer weight of 200-300 kg. Born and built for the tundra, hyenorks have thick dark fur, stubby thick limbs, broad shoulders and stupidly heavy jaws compared a human. Bipedal over short distances, they palm walk when required to move further than a sprint. Their front paws are tipped with heavy claws and lack fur. To prevent overheating in the chase, blood vessels in their palms dilate, using the cold ground as a heat-sink. For a hyenaork, a handshake is a deeply intimate act. There are no hyenork cities. There are no hyenork famers. What use is a farm to a carnivore in the tundra? Clans of females follow the herds of tundra grazers as they follow the seasons. Each female will have up to four kits a year, but only one of those four is likely to survive to adulthood and reaching 30 years old is very rare. Males form smaller bands of a dozen at most, and travel between female clans. Social status is gained in wrestling matches, and silver scarring rippling through fur is considered deeply beautiful. As might be expected for nomadic pastoralists, as a race they are largely in the stone and ice age. Leather from mammoths or musk-ox is the major resource, with many household items being made from combinations of animal skins, bones and compacted ice. Rushes, moss, herbs, dyeing plants and other summertime growth also finds its uses. Wood is sometimes harvested in the southern parts of their range, stone and flint from the south side of peaks. War Parties will often seize iron tools and weapons as loot, and there are some trade routes established with certain states. Magic wielders are rare amongst the clans, literacy rarer still. Hyenorks have a natural healing magic, but it simply allows them to close wounds and bounce back much faster. Using this power takes a lot of body fat, and it is the mark of a successful clan that they have a rich enough diet to indulge in wicked brawls. Limbs and eyes do not regrow, and brain damage will result in severe personality loss or worse as neural patterns are overwritten with new, random growth. Religion is not organised and remains an awareness of omens, of small gods and spirits and advisers to clan matriarchs. Major universal beliefs are in the cyclic battle between the Summer Sun and the Howling Night. One is a symbol of good luck, comradeship and fat bellies; the other of darkest nights, starvation and cannibalism. The Wendigo is a curse laid upon any Hyenork who consumes another's still living flesh. The Wendigo grows continuously and painfully. It is always on the brink of starvation, and any meal consumed just makes it grow faster. Unable to put on weight and maddened by hunger, Wendigo's rarely survive a year in the tundra. The Northern Lights are thought to represent the ghost world, of spirits fighting to prove themselves worthy to be born. It is said some Hyenork's can read the future in the sky and control the winds, but it is also said the moon is a great skull, full of marrow and brain and ripe to be crushed. Order of Battle at the start of the game. In future, see the link above for an updated one. .	.	Harp Mammoths	180	points	30 Harp mammoths with 3 crew each. .	.	War Mammoths	14,400	points	1800 trained war mammoths with 4 crew each. .	.	Seige Mammoths	5,400	points	450 trained war mammoths with 4 crew and a mounted cannon each. Most Hyenork tactics have been established from raiding or internal wars between tribes. Grand formation battles are rare, as it is hard to bring a nomadic race to defend a fixed point. Technology is typically stone-age, with heavy use of hunted animal by-products, but also moss, flax, rushes, dyeing plants and sliver and gold. Except in the south, good wood is in short supply. A normal raider pack consists of about 24 Hyenorks, armed with slings and claws. They wear little armour (or clothes), except for one to three utility belts at the waist or shoulders. Each Hyenork raider carries a pouch of sling stones or holed stones looped onto a belt, normally enough for about five volleys. The belt may also carry useful flints, awls, bones, lucky charms and decorations. The slings require much more space to use then arrows or muskets and so Hyenorks naturally adopt a scattered formation. As hunters, they are practised with the sling and with the use of cover from an early age. The slings-stones carry as much energy as arrows, but impact on a larger area - even minimal thick woollen armour will negate most of their effect. Range of up to 600m is achievable, but inaccurate. In close combat, most Raiders use their short claws alone for speed and dexterity, but some will use stone knives or clubs, especially going up against tribes where leather armour is more common. Because of their flexibility, strength and healing ability, a basic Hyenork Raider costs 1.5 points. It is considered likely a force of 30 Hyenorks would crush a force of 45 muskeeters. A force of 3000 Hyenork raiders against 4500 Musketeers with field guns would loose badly. Balance is anticipated around the 650 hyenorks vs 1000 musket-men level. 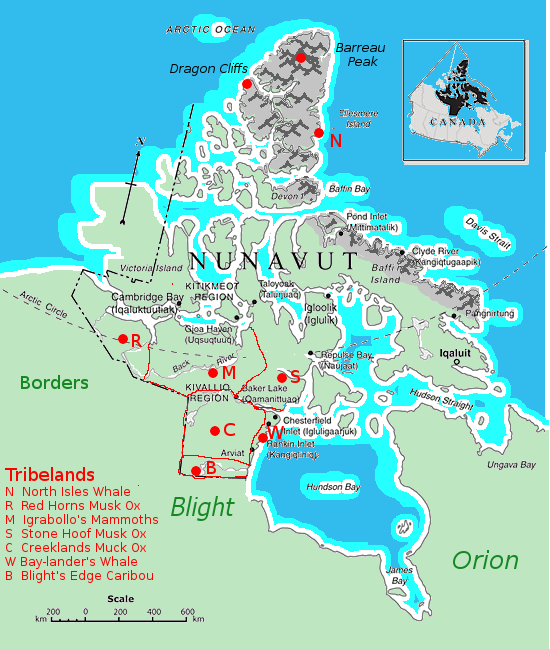 Queen Igrabollo's war mammoths have conquered much of Nunavut. They are huge shambling beasts with a leather howdah that carries two raiders and one driver. The mammoth's themselves have huge tusks, strong trunks and a ferocious charge that smashes most enemy lines. Some drivers will add spikes to their mount's legs, or train them to use a flail with their trunk. The two raiders in the howdah have a large stock of slingstones, and protected at close range, they punish the enemy on the flanks. Even so, War Mamoths are vulnerable to being flanked and pricked into madness by infantry. A wise commander will always deploy raiders between and behind the mammoths to guard against this. Chiefs and commanders will often ride a War Mammoth for the clear view of the battlefield. An accompanying drummer or flag-man lets other chiefs know when they attack, move and retreat. One of the Queen's greatest innovations was trade, and bringing in cannon and gunpowder, small though both are. She first used them as traditional ground based '8 pounder' support in wars against other mammoth tribes. Once she had mammoths to spare, she had the guns mounted on the largest beasts, often having to deafen them to prevent panic when the gun fired. They fill a role similar to that of the traditional war mammoth, but the greater range and power of cannon to slings allows the seige mammoths to tackle huge warbeasts with ease. The howdah carries a set of ground stone cannon balls, stacked by size. As the battle continues and the cannon barrel fouls, smaller and smaller balls are forced down by the gunners. Cleaning is left until afte the battle. Rate of fire is more important. Grape shot and buck shot are considered a waste of powder against other Hyenorks. Sometimes, when the Howling Night is strong, things crawl out of the sea to the north. Bubbling, rippling with change, hungry for flesh. Their hunger is infectious, and while a contaminated hyenork, tied to a rock, will beat the disease in a few exausting days, left free they are likely to kill to feed, and rise as a Wendigo. The things have an abhorrence of music, it charming and locking their writhing forms so they can be hacked down and burnt. On the North Coast, the preferred instrument is a twin harp of tusk and hair - the trumpet shape of the tusk serving to amplify the thunderous riffs in a focused cone of harmony. A hyenork carrying a harp is welcome anywhere, and often act as mediators in tribal wars, seeking unity for their race. Since first sunrise, the mammoth tribe on the north coast has made mounts available to the Harpers so they may quickly travel and challenge the things wherever they come. Queen Igrabollo has wisely continued this tradition. When Harpers take the field, as well as the direct challange to the things, their music synchronises the Hyenork army and by referencing sagas each hyenork becomes aware of their place in the whole, with the disorganised rabble moving in fluid formations like one great beast. Outright magic is exceedingly rare amongst Hyenorks. The Queen has collected all within her tribe that deserve that description and commanded them to maintain the royal armory. Drawing on the power of the Golden Sun, the hyenork small god of food, plenty and comradeship, the Sun Smiths tend the royal cannons. Their work is evident on some of the older cannons, where the cracks in the iron have widened enough the gloden metal holding them together can be seen. When threatened, they turn their powers on themselves, fur to golden mail, claws to golden blades. Light pools around them, as does a crackling cold. But this is only in the daylight months. Over winter, when the Howling Night rules, they earn their keep by grinding cannon balls and replenishing stockpiles along the migration routes. These fierce smelly beasts are barely controlled and ferocious on the charge. Their musk-ox mounts are fairly similar. There is no finesse to using cavalcades except for the need to space the groups so one does not stampede another. They hit the enemy lines like a wall of muscle, bone and horn. Hyenorks will lean and rake with claws and perhaps long handled goads. It is a rare battle they manage to charge again. Sadly outdated, even by Heynork standards, the war chariots are heavy frames pulled by two musk oxen, carrying a crew of three. The war chariots use thier speed and momentum to plough deep into the enemy flank, providing a heavy wall that impedes others movement while the crew fight or sling at those around them. The only tribe to make extensive use of them is the Stone Hoof Tribe. As the name suggests, they live in areas of flat stone and thin soil. A reaction to Igborollo's war of conquest, shield raiders take to the field with heavy layered leather sheilds and train to fight as a tight unit with slingers behind. As a formation, they can hold back charging raiders and stand firm against heavy slinging. The heavy shields slow movement and increase the risk of overheating. Counter-charging is reduced to a slow advance, with stone filled slings being used as flails before thier implacable advance. Between battles their shields are strapped to musk ox along with the rest of the supplies, they are simply too heavy even for a 300kg Hyenork to carry long distances. A living hyenork has his limbs broken, flesh opened and jaw dislocated. The bleeding yet living body is mounted onto a flayed musk ox. Their limbs are tied together, the musk ox's head is opened and streched such that the hyenork's jaws are merged in. Fat is poured liberally into both mouths. Spurred into overdrive, the Hyeork's healing ability consumes most of the musk ox, and several others that will be fed to it that day. Its hide stretches, jaws expand and claws thicken. The giant, howling four legged beasts that emerge from this process are quite insane, but durable and aggressive enough to take down a war mammoth, often climbing or leaping onto their back to bite through the spine. The procedure is delicate, and requires the knowledge and skills of one of 33 different shaman who have walked the Blight to gather the ingredients necessary to keep these beasts alive in their transformation. They are created only in great need and the day before their planned use, as caging them is difficult, and feeding them more difficult still. The two major sources of wood in Nunavut are the Blighted forests to the Southwest, and driftwood along the coast. Of the latter, strong, straight trees are rare, and a more common alternive in boat building are whale ribs, with a oil skin covering. Something larger enough to fit 6 Henorks is almost at the limit of the materials, and Rib Boats at this size are used in the summer months to allow the Coastal tribes to hunt further from shore. Veterans of the coastal tribes, a driftwood raider fashions his own bow from selected wood and hair and glue. Arrows are fletched with seabird feathers. It is not unknown for a driftwood raider to implant feathers in the flesh of their shoulders for decoration and camouflage. Inland Hyenorks rightfully view them as sneaky and opportunistic. They are less likely to close to close-combat then normal raiders. They prefer not to risk their bows being damaged in melee and are generally content to pursue, snipe and loot. Unique to the North Isles Whale tribe, wind kenners sing to and listen to the wind. They hear snatches of prophecy, of warnings and keep a watch to the North. In other ways they are very like normal Hyenorks. They fight, feast and mate with the seasons, and it is only when the wind murmers do they pause and listen. Thanks to their daily chanting, the seas around the North Bay are often calm and ice free, with the winds so arranged the floating ice fetches up elsewhere. This polyana is rich in sea-life that supports the hyenorks in turn. Should strange ships be sighted, or things stir on the western isles, great storms and blizzards will start to blow, leading many outsiders to conclude the area a wasteland. Unique to the forest dwelling Caribou tribe, the Antler Reapers have emerged from skimishes with Musk Ox Calvaclades on the forest edge. With the relatively frail caribou unable to carry them, they were forced to adapt to anti-calvary tactics. They still carry the sling of all raiders, but they also carry a six foot pole, tipped with a sharp antler mounted crossways. After the calvaclade has charged and scattered the Antler Repaers set to work, catching Heyenorks on ox-back and tearing them from their mounts. Hunting in the forest, on the edge of the blight, teaches a very different set of skills. Soft Paws use long bows, heavy arrows tipped with stone and a collection of poison darts and other plants. They pride themselves in moving stealthily, in their accuracy and their unflinching control of animals emerging from the blight. The joy of the kill is about the only thing other Hyenorks understand about them. The Wanderers are an elvish people from the Forests of Coronal, on the southwestern shores of the Bay of Ice (Hudson’s Bay). Fifty years ago, following a savage civil war, they fled their homeland due to a combination of invasion (notably raiding by the hyenorcs) and environmental change. They set out under the leaderships of a new and unproven Queen, traveling far and wide across the land. Though scattered, they have moved mostly westward, to the shore of the Western Ocean, and though divided, have remained mostly united out of fear of another civil war. 100,000 Elves. 2 points each (200,000 points in total). Ordinary citizens, though most have enough physical and magical capabilities to fight if they're attacked. Call them a militia. I'm counting them in my points despite the fact that they're not soldiers because they're somewhat superhuman and generally capable of combat, but they normally will not fight unless forced to. 9,000 Rangers. 5 points each (45,000 points total). Skirmishers/raiders/scouts/sentries. Fight with bows (and sometimes guns) and melee weapons. Often have limited magic. Light infantry. 1,000 Mounted Rangers. 7 points each (7,000 points). Raiders/light cavalry/horse archers. Fight with bows (and sometimes guns) and melee weapons. Often have limited magical skill. 500 Guards. 7 points each (3,500 points). Elite heavy infantry. Fight with bows and melee weapons. Often have limited magical skill. 1,500 Healers. 5 points each (7,500 points). Skilled at magic, specialize in healing. 1,500 Scholars. 10 points each (15,000 points). Elite mages. Tend to specialize in illusions, telepathy, and telekinesis. The Queen. 10 points. The sovereign of her people, resolute and courageous, but rather ruthless and inexperienced. Many have doubts about her reign. The First Captain. 10 points. The commander of the Guard and the foremost military officer of the realm. A close advisor of the Queen. The First Prince. 10 points. The Queen's daring (some would say recklessly irresponsible) brother, and a Captain of the Rangers. The First Healer. 10 points. Head of her order, and experienced if not terribly powerful. The First Scholar. 25 points. The greatest mage of his people, and a close advisor of the Queen. Assorted magical texts and artifacts. 15,000 points. Points used: 293,065. Remaining points: 6,935. 4,000 points to special fortifictions (to be built shortly). 2,000 points to ships/boats (to be built shortly). 935 points to new characters/new artifacts/miscellaneous. There are also a number of the Wanderers who have broken from their people, sometimes turning to dark, twisted magic. Small bands of these exiles have wreaked havok across the land, but should basically be regarded as NPCs, not part of the Wanderers. All troop types, formations, and order of battle listings below exclude a variety of noncombatants. Noncombatant support personnel include but are not limited to blacksmiths, farriers, armorers, quartermasters and sutlers, drummer boys, regimental bakers, aides to field-grade and general officers, couriers, surgeons, and perhaps most importantly, chaplains. While support personnel contribute directly or indirectly to the tactical and strategic success of Ohioan field formations by ensuring that the soldiers are equipped, fed, informed, ordered about, and protected from evil magic, they do not themselves carry arms. Therefore they are not deemed to contribute to the point value of said field formations, and any contributions they make to the formation's fighting strength are "averaged out" over the soldiery of the formation. In general their lives may be at varying degrees of risk in combat, but for varying reasons it is not practical to 'cheaply' defeat an Ohioan field formation by targeting its noncombatants. Obvious exceptions may be made in cases where the writing is compelling, and will be assessed on a case by case basis. Light infantry formations consist entirely of musketeers with the standard Ohioan bayonet-tipped flintlock musket, although attachments of grenadiers are not uncommon. They are often trained for warfare in built-up country or rough terrain. Their formation tactics vary but usually revolve around either a single firing line of three ranks, or two firing lines of two ranks that employ countermarching. They may also employ an approach in column comparable to that found in Napoleon's infantry, though this is considered a radical innovation and is not part of the standard manual of evolutions at arms. Despite this training and high standards of regimental readiness and preparation, they often seem not to stand on the open field as effectively or resiliently as the older, more traditional tercios. Despite this, they do possess the traditional Ohioan magic resistance and battlefield luck to a considerable degree- enough that it noticeably lowers their casualty rates when engaged in open battle. The core of the Ohioan army, the regiments labeled as 'tercios' consist of a roughly 1:1 mix of pike and shot, with pikemen typically being deployed in line eight ranks deep, and musketeers four or six ranks deep. The pikemen not only provide screening against hand to hand attacks, but also exhibit in double measure the resistance of formed Ohioan units to magic and supernatural creatures, along with the unique 'luck' that reduces the effect of artillery, fragmentation, and volley fire. This preternatural resilience, along with Ohioan conservatism, has kept pike units in the Ohioan army three generations after the first introduction of the ring bayonet- which has been almost universally adopted by the Ohioan military. The symbiosis between the virtually unique Ohioan pike and their musketeers creates a fighting force more effective than either of them would be alone. Ohioan light cavalry are recruited from the semi-nomadic horse tribes of the Illinois prairie, chiefly from the Kaskaskian Host, which has negotiated rights to grazing lands east of the Kaskaskia River that forms Ohio's formal western border. Some are mercenaries from the hosts further to the west. The tribes typically fight in light armor, with lance, sabre, and flintlock pistol. The Kaskaskians and other tribes seem not to enjoy the accustomed battlefield luck and magic-resistance of the Ohioan regular army, and when confronted with supernatural opposition, are the most vulnerable element of the overall Ohioan combined-arms force. Ohio has a cavalry tradition of its own dating back to medieval times and the origins of the Empire in the bluegrass country south of the Ohio. This tradition focuses around heavy shock formations, which remain relatively effective against at least a number of Ohio's typical opponents, although unable to penetrate pike blocks. Lancers typically wear half-armor or three-quarters armor into combat, and are armed with heavy swords and pistols along with their lances. Certain Ohioan tercio formations, with regimental histories dating back to feudal times... all that can be said, empirically, is that in the face of overwhelming fire or malign magic, they do what few other mortal men could do, and survive what few mortal men could survive. They are not distinguished by recruiting larger, stronger, or fitter men. Nor by superior arms, or modern tactics, or any other tangible thing. It is, so far as can be observed, purely a matter of esprit d'corps and regimental tradition... but these things do not provide protection against grapeshot, except apparently in the Grand Army of the Ohio. Without exception, the "old true-blood" formations date back to the War of Souls and nearly all distinguished themselves in combat against the necromancers. The secret to their success and victorious legacy is unknown, and no normal means will suffice to 'promote' an ordinary tercio to this blessed status. Typically expert in camouflage and infiltration (at least by the standards of 18th century warfare). Armed with the Kentucky long rifle, a hunting piece in origin, with a high muzzle velocity but a comparatively light bullet. Has to be reloaded by beating the bullet into the barrel with a hammer and an iron bar, resulting in very poor rate of fire. Highly accurate out to ~300 yards when used with precisely measured powder charges, as some but not all sharpshooters do. Sharpshooter units are typically attached to formations on wilderness duty, particularly light infantry, and are sometimes found in garrison duty in defense of fortifications. The Army has mostly standardized on cast-iron guns throwing four-pound balls. These are highly portable and have little difficulty keeping up with the infantry or even the cavalry when necessary. Some formations use the older three-pounders; others use foreign-purchase weapons of heavier build, typically six-pounders. Grape and canister are not unheard of, but are far from universal innovations. Ohioan artillery drill is less brisk than it ought to be, and thus their gunners suffer from a low rate of fire as well as the inherently low firepower of comparatively light pieces. On the other hand, deliberate fire and low caliber makes it relatively easy to sustain a high rate of fire over long periods. Ohioan siege guns are typically of 24pdr caliber and up, and are extremely unwieldy, designed more with riverboat transportation in mind than animal transportation. While effective in reducing fortifications, they lack the mobility and flexibility to be used in the field under normal conditions, and require extended time to transport into firing positions on land. Some mortar batteries are also employed, but there is little practical 'pointswise' difference in the effect of the bombardment. Ohio has spent considerable time and money establishing itself as the preeminent naval power on Lake Erie and maintains a respectable (if overworked and undersupplied) fleet on Lake Michigan as well. This is in addition to various minor boat units that keep order on the various rivers that provide both borders and trade routes for the Ohioan nation. Ohio relies heavily on galleys of varying size and has no individual warships comparable to the ships of the line used by oceangoing powers, relying instead on large numbers of relatively shallow-draft, agile vessels that can operate in the narrow waters of the Great Lakes. Used for patrol and customs duties on the Kaskaskia, Tennessee and Mississippi, where rivers form the borders of the Empire. Also for internal patrolling on the Ohio itself, and the many tributaries of the Ohio contained entirely within Imperial territory. There is also a squadron located at the mouth of the Ohio to help control the massive flow of river-traffic there where the Ohio leaves Imperial territory and enters Ottoman control. Large formations of riverboats are often supplemented by heavier craft classed as light galleys. Typical armament is of swivel gun caliber, with a squad of armed marines. All oared craft of the Ohioan navy are rowed by professional rowers who are at least lightly trained and capable of self-defense in a boarding action, though typically armed only with cutlasses. These ships are also employed for river duty, as well as providing the lightest class of picket and patrol on the Great Lakes. Typical armament is one medium-weight or a few light-weight cannon, along with arms in the hands of the ship's marine detachment and the rowers. Ohio's naval auxiliary continues to rely heavily on galleys to provide the numbers required to police and control Lake Erie and keep up a credible naval presence in the southern part of Lake Michigan. Galleys are vulnerable to storms but can maneuver independent of the wind. This is a particularly valuable asset to Ohio, a nation whose weather-mages are second to some and third to the rest. The large crews also provide supernatural protection, in keeping with the usual idiom of the Ohioan nation and faith. Typical armament is one heavy (12-18pdr) cannon or multiple medium (6-12pdr) in the bow, a few light guns in the stern castle, and a ramming bow. Oars prevent the ship from carrying a gun broadside, though swivel cannon may be mounted at a variety of points on the ship. Ships carry marine detachments and the rowers are, again, armed. These light, shallow-draft warships carry heavy siege mortars and are employed specifically for the reduction of fortresses on the shores of the Great Lakes. So far, the bomb ketch fleet operates entirely out of Lake Erie. Armament is one or two heavy mortars with no antiship armament of consequence. These conventional sailing ships operate on Lake Michigan and Lake Erie, typically having between 12 and 20 guns. They are all products of the last few decades, representing competitors to the traditional heavy war galley, and there is some uncertainty among the small Ohioan navy as to which design is preferable. Armament consists of a varying number of heavyweight cannon, typically six to ten broadside guns of 18 to 24pdr caliber, plus various pivot guns, chase armament, and the like. Marine detachments are comparatively large to compensate for the lack of rowers. Ohioan warships tend to have disproportionately heavy crews, which is viable because they never operate more than a few days from their home ports. Ohio traditionally relies on heavy galleys with gun batteries above their rowing decks and substantial sailing rigs as its heaviest warships to maintain control of inland waterways. These ships mount broadside armament competitive with the sloop-weight vessels likely to be found on the Great Lakes, but retain the capacity for ramming. To handle their great weight, the rowers operate several to an oar, often five or more. These form the core line of battle of the Ohioan fleet on Lake Erie. While their oar propulsion is nominal at best due to their sheer size, they mount respectably heavy batteries of artillery and are capable of competing with an oceangoing frigate, at least until seakeeping qualities are factored in. Under construction. More about these later. The Knights of the White Star were founded several centuries ago as a religious order militant, prior to the evolution of the crusading pike armies of the War of Souls. The dedicated among their ranks possess the very unusual ability within the Living-Star faith to personally focus divinely gifted energy, making them effective holy warriors. However, only a minority of the knights under arms are actually dedicates. The tercios partly supplanted the White Star's battlefield role as point men in the face of sorcery and monstrosity, and the order has declined in membership. However, it retains considerable financial and territorial assets dating back to its time as the chief defenders of the faithful. The order has large holdings and a large number of noncombatant personnel within its ranks, partly because it is the only religious order within the Church of the Living Stars that accepts men in anything other than a subordinate role. The knights are fairly often seen outside Ohio's borders, sometimes acting independently, sometimes as scouts or agents of the Empire's political agenda. Please note that the descriptions below are not formal ranks. 668 2pt cavaliers, lancers, and generally knightly warriors. Much of the Ohioan border is unfortified or lightly fortified, relying more on the protection of river lines, with fortresses located only at major river crossings. 4) Most other major towns on the lake shore of Lake Erie or Michigan have artillery-armed fortifications. These often include guns of between 12pdr and 24pdr caliber. On land, typical Ohioan fortifications are designed to resist cannon fire and assault by musket-armed infantry using the complex geometric patterns known on Earth as the trace italienne. Rather than surrounding a defended location with high stone walls, large, steeply sloped ramparts made of earth and brick are constructed. These ramparts have the ability to simply absorb cannonballs, even massive ones, without being significantly damaged. Corners and curves in the ramparts are protected by projecting bastions which contain most of the fortress's firepower, often including a liberal allocation of light, long-barreled, high-velocity artillery, swivel guns, and heavy-caliber wall guns that are fired like infantry muskets, but from bipod mounts, delivering greater range and striking power. Bastions are generally designed to provide interlocking fields of fire and to permit one bastion to cover its neighbors with gunfire if the enemy tries to defeat the defenses by getting too close to the enemy's guns for them to bear on him. Where the terrain and local watercourses permit, heavy Ohioan fortifications are also protected by wide ditches or moats. Some defensive positions include strategic inundations of water that can be released to flood a belt in front of the defenses up to hundreds of feet across, though this is rarely possible. Isolated points unlikely to face an attacker with long range artillery may be defended by stubby, thick-walled, rounded masonry towers, or by wooden blockhouses with palisades. Masonry towers are common defenses on the southern border (the Tennessee Valley), whereas an extensive blockhouse network exists on the Empire's western border in Illinois, and provides a basis for Imperial cavalry patrols which try to keep raiding by the plainsmen under control. In addition there are immense numbers of medieval-vintage fortifications, such as stone castles and walled cities, throughout most of Ohioan territory, especially north of the Ohio. However, many of these fortifications are in a poor condition of maintenance or are actively being dismantled by locals for building stone, and in general they were never designed to resist artillery fire. Major cities and towns in strategic, commanding positions usually have their medieval walls augmented with modern fortifications, as discussed above. I will eventually convert it to a BBcode format to embed in this post. I haven't yet allocated point values for my military, though I do not plan on using more than 150,000 in wartime, and likely closer to a third of that in peacetime, with much of it dedicated to the navy. Thyrsian Military would consist of 3 Corps: Their area of operation divided into three sections: North headquarters in OTL Rapid City, East HQ in OTL Denver and West HQ at OTL Omaha. With 10,000 additional points being allocated for route protection in each sector. Each HQ are 1,000 pnt fortifications with the capitol counting as an additional 3,000 points. This should put my total at 270,456 spent. Thyrs: Green skinned and heavily muscled, they stand on average 2 to 2.3 meters in height with the females being only slightly smaller. Typically they have dark reddish to black hair though others are not unknown with he males being able to grow a coarse beard. Eye color ranges the human spectrum and includes red and purple and they can see slightly better than the average human at night, though their limit is approximately the same as a human. Their primary distinguishing feature, other than green skin, is the twin elongated teeth jutting from the lower jaw. Humans: The native human inhabitants that were absorbed into the Empire though their own culture remains in places. Typically dark of hair and copper skinned. Wolven: These are similar to the native canines in form only as they are sentient with their own primitive howling language, though they can communicate far more through scent and body language. They are telepathic though the range is no more than 40 meters for the strongest. They are unable to breed with more native species of canine. Much of the Thyrsian Empire is the domain of the great herds of buffalo and as such the borders of the Empire are rather soft. These herds are carefully maintained and guarded. Mining makes up the greatest industry for the Thyrs, providing precious metals for trade, salt for a myriad of purposes, as well as other minerals and ores. The biggest down fall is the lack of trees in any real abundance except in the north west. Three main highways converge in the badlands, originating from OTL Omaha, Denver and Billings, these are paved and improved roads (In the roman style). Rails flank these highways providing merchant traffic and much needed supplies. Buffalo pull the carts along the rails with the western side going always north(ish) and the eastern side going south(ish), (basically travel is on the left hand side of the road. Currently a better form of propulsion is needed for the cars on the rails. Thyrsian soldiers can be identified by their distinctive steel kettle helm, yellowish-brown buff-coats with dark rank insignia on the sleeves just above the elbow, and their propensity for four to be in constant company. Civilians tend to prefer heavy brocade coats. Buffalo leather is a staple for clothing with brocade and bead-work being highly popular. Originally a union of clans, the Thyrs Empire slowly transitioned into three massive clans, with Thyrs, human and wolven being part of each clan. Each clan is home to its own military Corps though promotion is strictly merit based with officers attending the war-college in Harvool (OTL Rapid City) after advancing through the ranks to Sargent. Occasionally there are minor skirmishes between the three clans though that has tapered off to almost nothing in the last 100 years. In general, the Thyrs care nothing for religion, tolerating all that do not break the laws, and gender is irrelevant for any task. Two or more consenting adults may cohabitate as they will, though forcing ones self on another is grounds for swift execution. Slavery is unheard of as a Thyrs can do a better job themselves rather than making another do it for them. A society based on civil law, the fundamentals being literally inscribed on the stele before each town. It is here before the stele that a trained tribunal adjudicates trials. These judges are paid by the state and are expected to administer impartial justice. All major arguments and debates take place in front of the stele each ten-day, even if it is only to say nothing is going on. Military law is not unlike "Rocks and Shoals" a brutal, but effective, form of military governance. Government tends to be more militaristic simply due to the more warlike nature of the Thyrs, however, each clan has its own representatives selected from amongst themselves. These leaders are typically female and have its roots in a matriarcal clan structure. It is exceedingly rare for a male to be one of these representatives though far more common among the human populace. Traditionally there is a conclave of 300 of these representatives which make the laws, plus the current Empress. Garrison commanders hold the title of Marshall with the ability and duty to deputies others to enforce the laws. The mail wolves are protected by law with severe consequences to mess with them. While there is an infant form of semaphore that stretch along the roadways, typically nothing more than orange and green flags/lanterns to send simple messages. The vast majority however only worship nothing. The truth long lost to the depths of history, myth tells how Arkanu created the Thyrs then enslaved them until the broke off the chains. As such, they do not tolerate slavery well. Only historians and bards at the Imperial Bardic College could get closer to the truth. The mages of Mount Klavik have their own myths though they are few in number with the Order of the Black Inquisition training their keepers so that they do not unleash daemons upon the world. Daemons which are drawn almost exclusively to the Thyrsian mind when they cast. The mage is considered government property because of all this. In the Year of the Dragon, according to the ancestral calendars, Go-Daigo's expedition landed upon the unknown shores of a great continent and with him were more than a thousand, thousand ships. They landed upon a jagged peninsula and expanded outwards from there. On series of hills overlooking the inland sea, Go-Daigo planted the Imperial banner and claimed the land and named it "Nihon". Nihon is a land based in the north-east of the central continent, verdant and temperate in climate -- but prone to overly hot summers and harsh winters. The Emperor and his descendants found that the land they now occupied had once played host to a much older civilization. What was left of the indigenous population was either killed in the war of conquest or assimilated. The once grand cities that had existed lay in ruins, the last remnants of which were swept aside and replaced by Nihonese cities, palaces, and fortresses. Some still endure however, for there remains a small, unconquered city-state known as Phoebus just beyond the borders of the empire. For the past four-hundred years or more the land has been ruled justly and wisely by the Imperial Family. The current emperor, The Divine Emperor Kammu, 48th of his line, rules from the Jade Throne in the ancient capitol of Nara-kyō. Assisting him in his rule are the various courtiers and functionaries of the Imperial Court, each vying for control or influence. Nihon has tried to remain largely isolated by preference, but has found that the warrior houses that serve the great nobles and the Emperor are continually looking for new boundaries and new lands to spread to and conquer. Some outcasts of society resort to banditry and piracy, sending raiding parties along the coasts, both north and south. This has caused some tension with the northerners, whom the Imperial Court imperiously call 'the Northern Barbarians'. The Emperor rules as both the head religious figure of the realm and also as the sovereign from whom all power is ultimately derived. The rituals and rules that oversee the actions and daily life of the Emperor can seem strange or archaic to some, but are feverishly followed with exacting detail in order that the Emperor's life remain harmonious and therefore please the gods. Because of his various duties and religious rites to perform, the Emperor has little true day-to-day decision making powers. These are instead handled by the Imperial Court, which is divided into ranks of courtiers. The Imperial Chancellor has the power to discard, annex and transform domains; but only so long as each decision is pressed with the Emperor's own vermilion seal. The Chancellor guides the general direction of government and is the most senior at court after the Emperor himself. The Minister of the Left stays and attends upon the Emperor, including advising him on his personal matters, supporting him in the maintenance of a proper dignity and helping him in the observance of proper forms of etiquette; assisting in the inspection and countersigning of drafts of Imperial Prescripts; making of presentations to the Emperor; and monitoring the reception of addresses to the Emperor. The Minister of the Right is charged with overseeing the list of courtiers seeking an audience with the Divine Majesty, and either allowing or denying them the right to an audience; maintenance of the records relating to the personal status of imperial princesses from the second to the fourth generation; maintenance of the records relating to the maids of honour and other court ladies; and supervision of the Imperial archives. The Minister of the Center is the chief of the Ministry of the Center, to duties which are oversight of the submission to the Emperor of the census of the population in the various provinces, oversight of the submission to the Emperor of the accounts of the taxes to be levied, oversight of the submission to the Emperor of the lists of the priests and nuns in the provinces, administration of the annual expenditure of the court and to various articles to be provided for the use of the Imperial family, supervision of the astronomical calculations and the arrangement of the calendar, oversight of the pictorial artists and musicians at court, and maintenance of order in the palace. The Chief Counselor is, besides an important court position, also the chief administrator of the Ministry of Civil Services, to which responsibilities lie the regulation of medication to be supplied to the Emperor and the medical advice to be given him, supervisory body of the Daigaku-ryō (State University), conduct the yearly Civil Examination which all courtiers must pass to attend court, and authority to grade the performances of civil officers, recommend their appointments and awards, and decide on their ceremonial seniority and privileges for those under the Second Rank. The Ministry of Ceremonies is headed by a member of the Third Rank. It is responsible for the maintenance of the roster of names of all officials of and above the Fifth Rank, oversight of the succession and marriage of officials of and above the Fifth Rank, oversight of formalities relating to deaths, funerals and the granting of posthumous rank; management of the memorial activities which honor the anniversaries of the demise of a former Emperor; monitoring and recording of the names of all the former Emperors, so that none of those names shall be used by any of the succeeding Emperors nor by any subject; adjudication of disputes about the order of precedence of the various families during court functions; and reception and entertainment of foreigners and managing to their presentation to the Emperor. The Ministry of Taxation is headed by a member of the Third Rank. It is responsible for supervision of the census of the population of the various provinces, regulation of the contribution of forced labor as tax, determining exemption from forced labor as tax, rewarding of subjects distinguished for filial piety, or for their integrity in dealing with other people, or of subjects in distress, or of officials of certain classes; maintenance of bridges, roads, harbors, lakes, farms, mountains, and rivers; administration of the estimation and collection of taxes in products; oversight of the disbursement of the national funds and estimates of national expenditures; regulation of state granaries; and oversight of land tax estimates. The Ministry of Justice is headed by a member of the Fourth Rank. This ministry is responsible for administration and conduct of trials, oversight of the determination of the severity of punishments, and regulation of the imposition of fines, imprisonments, and penal servitude. The Minister of Justice is also commander of the Palace Guards. The Samurai Dokoro is headed by a member of the Fifth Rank. This ministry's responsibilities are for oversight of the rosters of military officers, including examinations, appointment, ranks, etc. ; supervision of arsenals of weapons, guards, fortifications and signal fires; maintenance of pastures, military horses, and public horses and cattle; administration of postal stations; and acting as the police force of the Imperial capitol. Warriors serving in the Samurai Dokoro may also act as executioners after being handed down orders from the Ministry of Justice. The Ministry of the Treasury is headed by a member of the Fourth Rank. This ministry is responsible for administration of public accounts, oversight of tax collections and of offerings to the Emperor, regulation of weights and measures, control of the fluctuations in prices of commodities, regulation and oversight of the coinage of gold, silver, and copper money, maintenance of the lists of artisans engaged in coinage-related activities, and the regulation of activities in the manufacture of lacquer ware, weaving, and other kinds of industries. The Ministry of the Imperial House is headed by a member of the Fourth Rank. This ministry is responsible for supervision and maintenance of rice fields for the supply to the Imperial family, oversight of the harvesting done on the Imperial domains, orchestrating the presentation to the Emperor of rare delicacies as gifts from his subjects, administration of the culinary and engineering departments of the court, oversight of court ladies, oversight of court smiths, oversight of court breweries, management of court servants, oversight of Imperial wardrobe, and attending to all princes and princesses of the 2nd to 4th generation. Beneath the aristocrats are the numerous military/warrior houses and clans. Each clan is either independent and pays fealty to the Emperor directly or serve by one method or another under the guidance of an aristocratic house to which they have historically served. Vassals hold inherited lands and provide military service and homage to their lords. There are seven provinces, each which has a governor appointed by the Emperor. The samurai clans serve as police, tax collectors, and minor administrators of some land holdings. There are three types of traditional music in Nihon: instrumental, theatrical and court music. Noh or nōgaku is another type of theatrical music. Noh music is played by the hayashi-kata. The instruments used are the taiko, ōtsuzumi, kotsuzumi, and flute. Gagaku is court music, and is the oldest traditional music in Nihon. Gagaku music includes songs, dances, and a mixture of other music. Gagaku has two styles; these are instrumental music kigaku and vocal music seigaku. Shōmyō is a kind of song which is an added melody for a sutra in Shinto ceremonies. Shōmyō came from ancient times, and it became popular in the Golden Age more than two hundred years ago. Shōmyō is sung Capella by one or more monks. Painting has been an art in Nihon for a very long time: the brush is a traditional writing tool, and the extension of that to its use as an artist's tool was probably natural. The subject matter that is widely regarded as most characteristic of Nihon painting, and later block prints, is the depiction of scenes from everyday life and narrative scenes that are often crowded with figures and detail. Garden architecture is as important as building architecture and very much influenced by the same historical and religious background. Although today, ink monochrome painting still is the art form of popular choice, most closely associated with Zen Shinto. A primary design principle of a garden is the creation of a landscape based on, or at least greatly influenced by, the three-dimensional monochrome ink (sumi) landscape paintings, sumi-e or suibokuga. In Nihon, the garden has the status of artwork. The Nihonese diet consists principally of rice; fresh, lean seafood; and pickled or boiled vegetables. Food is eaten with two small lacquer sticks, called hashi. The idea of eating with your hands or a knife is considered barbaric. From the highest courtier to the lowest peasant, all pay fealty and worship the Divine Emperor. To pay your respect to the Emperor is a form of worship to all the gods, for each is related to the other by various ways, and this can take place in the many shrines and temples built around the realm. Respect and filial piety for ones elders and family are paramount. For a father to fail to raise his son well is considered a serious crime, and the same can be said for a son to fail to look after his father and mother in their advanced age. The warrior clans of Nihon follow a largely unwritten form or code. It is generally believed that a true warrior should feel nothing but contempt for worldly possession and treasure, rather his entire mind should be bent towards how best to serve his master. A warrior must strive to die bravely in the name of his master, try his best to die well; but if failing this, it is no great shame to admit that even when willing to go to the ultimate end, that there are other avenues to pursue in the service of another. From the young and tender age of five, every boy born into the house of a warrior family is trained in the arts of the flintlock musket, bow, horsemanship, sword, the spear, the halberd, the knife, and the unarmed fist. A warrior who cannot fire an arrow true to its target under three hundred yards is not worth the armor he wears or the lacquer bow he wields. Koku is the basic currency that is used in Nihon. A single koku is the amount of rice or barley that it takes to feed a single man for a year. All lands try to grow rice as their main source of income. 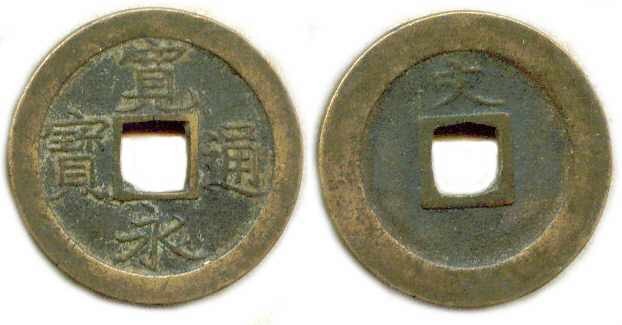 But because it is impractical for merchants and peasants to use rice to barter for everyday household goods, the Imperial Family developed a nation wide coinage. In Nihon there are several gold and silver mines, and from these are the coins of the Imperial Court minted. The purity of the coinage is carefully kept, else the economy of the realm might fluctuate too much beyond easy control. 1 Koku of Rice weighs 330lbs. The economy of the land is based around a number of industries: lumber, precious and industrial ore mining, rice and grain agriculture, artisanship, lacquer-ware, medicine making, and manufacturing of various goods. Each of the great cities and castle-towns of the empire act as market places, with the largest and most important being at Nara-Kyo. The tax rate under normal circumstances is 1% and sometimes would climb as high as 3% in situations such as war. These modest taxes are levied against land, homes and other real estate, slaves, animals, personal items and monetary wealth. Taxes are collected from individuals and, at times, payments could be refunded by the treasury for excess collections. If there is limited census accuracy, tax collection on individuals is a difficult task at best. To ease the strain of inaccurate census data, taxes can be assessed as a tithe on entire communities rather than on individuals. Tax assessments in these communities fall under the jurisdiction of provincial governors and various local magistrates, each of whom must report their receipts and taxes to the Ministry of Taxation. A recent trend in some parts of the realm is the practice of tax farming. Tax farmers are used to collect these taxes from the provincials. Nara-kyo, in eliminating its own burden for this process, would put the collection of taxes up for auction every few years. The tax farmers would bid for the right to collect in particular region, and pay the state in advance of this collection. These payments were, in effect, loans to the state and the Imperial Court is required to pay interest back to the tax farmers. As an offset, the tax farmers have the individual responsibility of converting properties and goods collected into coinage, alleviating this hardship from the Ministry of the Treasury. In the end, the collectors keep anything in excess of what they bid plus the interest due from the treasury; with the risk being that they might not collect as much as they originally bid. The great warrior clans of Nihon have existed for centuries, many of them tracing their ancestry back to the founding Imperial House that first conquered the land so far ago in the mists of time. These clans have claimed power through varied means; by treachery, by military prowess, by marriage, by wealth, by magic, and some by political prestige. All pay homage to the Emperor, but beneath the great clans are many other lesser clans, many who wish to someday supplant a great family and their fortune. The great clans however have an enemy in the Imperial Court, where the nobles and courtiers look down upon the warriors as uncouth and without manners. As it is said from ancient times: "a boiling pot if left unattended will eventually blow over." The Miyoshi Clan has been in existence for three hundred years. Their humble beginnings sprout from the fiercely independent traders, seamen, and wako pirates that infested the eastern peninsula of Nihon since ancient times. The clan traces their lineage to Prince Tohki Miyoshi-no-Kami, who led his personal retainers from the capitol by order of the Emperor and subdued the northern clans by his force of will and by the power of his arms. By such a fierce show of power, the pirate bands and communities of the north bowed their heads in obeisance and pledge themselves to the prince, the most beautiful daughter of the most powerful pirate chief offered as a way to seal the bargain. Thus was the Miyoshi Clan was founded. They are a proud lot, are the Miyoshi, renown through the land as the best seamen and corsairs in all of Nihon. By gift of the Emperor, nearly all of the northern coast of the provinces were given over to the Miyoshi Clan as their personal fief. The power of the Miyoshi clan lies in their ships and skills at sea. Though their retainers do not number as high as some other great clans, their individual skills as fighters and seaman make up for this lack. They are renown for water and weather magic. The Otomo Clan are considered to be the oldest warrior house alongside that of the Imperial House. They trace their lineage all the way back to the founding of Nihon, their grand-sire being the brother of the Emperor Do-Gaido. Because of this familial connection, the Otomo Clan have benefited greatly. They control over half of the entire province directly and the other lands are either controlled by religious orders or by lesser warrior clans that have given fealty to the Otomo Clan. Because of their blood ties to the Imperial Throne, the Otomo clan are perhaps the most politically adept within the capitol of Nara-Kyo. The current head of the Otomo clan, Otomo Sorin, had been given the Fourth Rank -- an unprecedented act in the history of Nihon, for helping to quell a peasant rebellion near the capitol. With his rank, Otomo Sorin was granted the position of Minister of Justice and as a result commands the Palace Guards that protect the Emperor and the Imperial Family. Tradition and honor are the core virtues of the Otomo Clan. Their power resides both in their blood relations, and in the large proportion of samurai that serve as retainers to the Otomo Clan. The skill of Otomo swordsmen is considered to be among the best in the realm. The fact that they employ the finest swordsmiths in all of the empire is seen to help as well. Their particular brand of magic is focused on the martial aspects – enabling their warriors to exceed the limitations of normal men. The Kuroda Clan is a more recent addition to the level of power that is held by the great clans of Nihon. Less than a hundred years old, the Kuroda Clan was founded by an enterprising warrior named Izu Masako; who took his name from the province he hailed from. When the Emperor's consort and favored lady, Emiko-hime, became sick with a malaise that no doctor could fathom or heal, a call went out to discover any ancient healing techniques or magical items that could be used to help. Many priests and magicians tried their best, some blatantly trying to swindle gold from the dire situation; but all ultimately failed. That is until a warrior chieftain at the head of a small warrior band appeared before the Imperial Palace and brought the still bleeding heart of a hydra, a mythical beast that had not been seen in over two hundred years. The alchemists in the Imperial Household were able to use the hydra's heart to make an elixir that healed and saved Emiko-hime from death. So grateful was the Emperor that he presented the chieftain, Izu Masako, with the new family name of Kuroda -- an ancient name that had belonged to a prince of the Imperial line -- and presented them with a fief in the province of Izu. Within two generations the Kuroda Clan spread their influence across Izu, to the point that though they are only the vice-governors of Izu, they have more power in the province than the Imperial Courtier family, the Katakura Clan. Because of his humble origins, Kuroda Masako was able to gain the allegiance and obedience of the lesser warrior clans and peasants of Izu, a man whom many saw as being one of them. Though the other great families and the court nobles look down upon the Kuroda Clan as little more than upstarts, none can deny their strength. As wardens of the realm in the south and possessing some of the largest fiefs in the province of Izu, the Kuroda Clan has a large retainer base. Few other clans can claim to have as many ashigaru within the ranks of the personal warbands. Many lesser samurai also follow the Kuroda Clan, eager to serve upon the frontier where riches can be made. The Kuroda clan is renown for it's organization abilities and leadership. Each warrior clan is responsible for fielding as many retainers or samurai as possible, and outfitting them with the best possible weapons and armor. It is their duty as vassals to their liege lords that they do this. Below them, each samurai that holds fealty to a lord is in return to recruit and equip a number of ashigaru, or foot soldiers, that are little more than conscripts. The main fighter of the Nihon armies, the samurai is skilled in archery, swordsmanship, horsemanship, and marksmanship and a number of other martial arts dependent upon their lord's preference. However, all are skilled in those four basic fields of combat. Their armor combines plate and lamellar elements, each covered in lacquer for protection against weathering. One specific advance over other types of armor is that the lamellae of Nihon are first laced together and then covered with lacquer, which enhances resistance to corrosion; this combination of plate and lamellar allows the samurai to be quick, flexible, and still be protected. Though it is not proof against the bullet of a flintlock musket, at certain ranges it can stop a bullet from fully penetrating the body. Using horses bred for war, samurai cavalry has the distinct advantage of being able to fill several different roles on a battlefield. They can act as horse archers, mobile musketmen, heavy cavalry, scouts, and messengers. Some warrior chieftains form samurai into distinct fighting arms, making them specialized in filling a specific role on the battlefield, and one that has risen to prominence is cavalry. Falling back upon the most ancient form of fighting within the lands of Nihon, samurai wielding bows on foot are an essential part of any lord's army, acting both as part of a castle's garrison and in units on the battlefield. The famous Nihon yumi bow is made of lacquered bamboo, and each is normally much taller than the average man, at just over 6ft in length. Using ki-techniques, a skilled archer can hit a target up to five hundred meters. The mainstay of all armies within Nihon are the Ashigaru, literally light-foot, that are made up of conscripts recruited by samurai from the peasant class. The skills and weapons of Ashigaru are based according to the wealth of a daimyo, how much he spends time and money on their training and weapons, respectively. The average ashigaru is armored with light, leather armor that imitates the heavier and better made samurai armor. Their arms can range from simple sharpened bamboo spears, to the Nihon spear, or Yari, that can be anywhere from 3 to 8 meters in length; a single long or short sword for a side arm; or a bow. Others, such as those that serve the Kuroda Clan, are armed with flintlock muskets. Considered to be the oldest form of magic within Nihon, stretching back into antiquity and beyond memory, Onmyodo is an esoteric mixture of natural science and occultism. The basic ability of an onmyodo user is to summon a spirit, or shikigami, that is used to protect and serve it's master. The strength of a shikigami is dependent upon the strength of will and magic of the onmyodo user that summoned it. If a spirit does not believe it's summoner is strong enough to control it, it will try to kill the magician during the summoning process. Once a shikigami is bound to a master, they will serve until the user is killed or breaks the binding. Other applications of Onmyodo Magic are: divination, exorcism, spiritual/aura awareness, sealing, and paper charm magic. Equally as ancient as Onmyodo, but considered to be uncouth and unrefined beside it, is Ki Magic. Users of this power have mastered their inner and natural energies, known as ki, and utilize it as a form of magic. Samurai warriors are those that train the most with this form of magic, while courtiers and nobles consider it far beneath them. The more a user of ki magic uses their ki power, the more experienced they become. Ki Augmentation – the user can channel their own ki through their own body to enhance their physical abilities. This gives enhanced: agility, durability, reflexes, senses, strength, speed, and a technique known as 'tranquil fury'. Life-Force Manipulation – the user can control their own personal life-force that dwells within them and allowing them to achieve power and abilities that are as close to demi-god as could be considered, in it's extreme form. Controlling and manipulating the life-force of the user's self and others, the powers allow: age manipulation, aura reading, death sense, healing, ki sense, life-force absorption, life-force attacks, life-force transferal, telekinesis, regenerative healing, and aura projection. Magical Energy Manipulation – the user can create, shape and manipulate magical energy to use magic for a variety of effects. These include: creation, curing, destruction, elemental manipulation, force-field generation, illusion manipulation, magic imbuement, magic negation, telepathy, and energy absorption. Nature Unity – the user can become one with the natural forces and elements around them, their soul sensing a great deal of peace and contentment. A user can cause animals and beasts to lose their aggressiveness around the user with little more than their presence; and can sense other living creatures. Once a user becomes unified with a particular element or animal, they can affect them in unique ways. Applications such as: animal imitation, beast manipulation, ecological empathy, elemental manipulation, nature manipulation, and planetary empowerment. (1) Kami are of two minds. They can nurture and love when respected, or they can cause destruction and disharmony when disregarded. Kami must be appeased in order to gain their favor and avoid their wrath. (2) Kami are not visible to the human realm unless they choose to be seen. Otherwise they inhabit sacred places, natural phenomena or people during rituals that ask for their blessing. (3) They are mobile, visiting their places of worship, of which there can be several, but never staying forever. (4) There are many different varieties of Kami. There are 300 different classifications of Kami and they all have different functions, such as the Kami of wind, Kami of entryways, and Kami of roads. (5) Lastly, all Kami have a different guardianship or duty to the people around them. Just as the people have an obligation to keep the Kami happy, the Kami have to perform the specific function of the object, place, or idea they inhabit. To please the gods, yearly festivals are held and great ceremonies, known as kagura, are held. Some of these are simple and take place in the villages and hamlets of the peasantry, more like a day of thanksgiving than true worship. The Imperial Family itself is responsible for making obeisance and to appease the Ancient One, known as the Grand Dragon, Izanagi – who is, according to legend, the greatest dragon to ever exist, sleeping in peace beneath the land of Nihon, it's dreams made sweet by the Imperial Family's ceremony. Should the ceremony ever fail to take place, it is believed the dragon will wake and that calamity will befall the land. The god of war and the divine protector of Nihon and its warriors. His symbolic animal and messenger is the wolf. The god of the wind and one of the eldest Shinto gods, said to have been present at the creation of the world. The god of thunder and lightning, and is the twin brother of Fūjin. The goddess of rice and fertility. Her messengers and symbolic animal are foxes. The god of scholarship and knowledge. His messengers and symbolic animal are owls. EDIT: The galleons will now be worth 400pts each, representing a war fleet of 50 galleon ships.